Just a quick little check off list to the Elephant’s and my original list, and first update on the list. Both weapon achievements: Knuckle Sandwhich and Four Types. They’re now feats of strength. All of the critter achievements. There’s now a new one… which I am diligently making a list for. Maybe I’ll even post the list when I’m done with it. The book achievement. Though, with the little exploration we’ve done, it looks like most books are generally in the same vicinity as they were before the Shattering. Loremaster of both Eastern Kingdoms and Kalimdor. And we’re glad we got it out of the way, too. All of the changes really screwed some guildies out of theirs. One was about 600 quests into each and now has practically none. We fought our way through lots of dungeons to get Classic Dungeonmaster. Glad it’s finally done, though, we will still need to go back as a guild and down all the bosses for the Guild Achievements. Yay for fun nights! Ambassador of the Horde was a fun one as well. 😀 Lots of low-level quests toward Loremaster which just gave us the rep we needed. No cloth quests at all. The Argent Dawn and Argent Champion came together. It was awesome. I wore that title for days after I got it. We even maxxed out our rep with Zandalar. I’m glad we did. Even if it is a feat of strength, now, it counts toward our reps still. Timbermaw was pretty easy to grind out. We took turns smashing and looting, but we still shared rep from kills. It was great. 🙂 We’re also just one step away from our Diplomat titles now. Come on, Mag’har! Swift flight form! The quest was so much fun to do with someone else. Instead of trying to solo it… at 70. We had gotten various quest complete achievements, but with all the changes, our ~2500/3000 quests keeps waffling between ~1400 and ~2500. Make up your mind, Blizzard! The Deadliest Catch. Most. Fun. Ever. 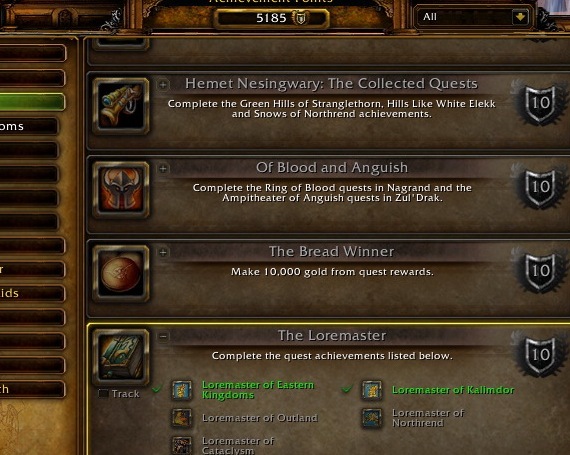 Various holiday achievements; Brewmaster, Hallowed Be Thy Name, and Pilgrim in particular. We also got a For the Horde in one late night. Figured “What the Hell” and got all of them in one shot. Downing Sarth with three dragons (which we’ve now made a regular weekly event to get people their drakes). Well, that’s a pretty extensive list. The only things we haven’t checked off of it (yet) are reaching Exalted with both the Brood of Nozdormu and the Hydraxian Waterlords. But since they aren’t going away, we didn’t deem them necessary for completion anytime soon.